Very few people can claim they’ve witnessed the unspoiled and breathtaking beaches of Fernando de Noronha. This island is off the northeast coast of Brazil, and has been declared a marine national park back in 1988. Today only 420 tourists are allowed on the island at any time. The lucky ones who do visit the island are treated to the natural beauty, both on land and at sea. The island lies within a volcanic archipelago of 21 islands, and the landscape includes rock sculptures, waterfalls and natural swimming pools. Tucked beneath the cliffs and caves are exquisite white sand beaches. With crystal-clear waters, rich marine life, including the highest known concentration of resident dolphins in the world, and spectacular tropical landscapes, it’s heavenly. The dolphins are known to leap spinning into the air, and Fernando de Noronha is one of the few places in the world where there are actual dolphin-breeding colonies.The waters off Fernando de Noronha are chock full with other delights including colorful fish, lobsters, turtles, sponges and corals. This makes it a favorite diving and snorkeling location. Considered a marine ecological reserve, Fernando de Noronha is protected by the government. Surfers consider the large waves to be some of the best surf spots in the world. Fernando de Noronha Brazil is listed as one of the top 20 beaches in the world. Here you can find information on all of the 20 most beautiful beaches of the world. 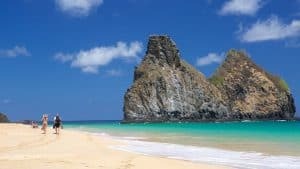 Read our Fernando de Noronha Brazil Vacations guide to start planning your vacation to this wonderful beach destination. Fernando de Noronha is an all year round destination, but the best time to visit the islands and to fully enjoy their attractions is the dry season: from August to January. 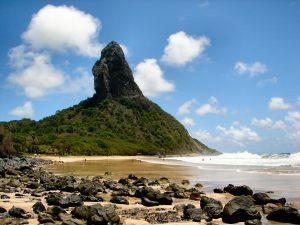 Fernando de Noronha’s climate is tropical with two well defined seasons: the dry season, mentioned above, and the rainy season, from February to July. March, April and May are the rainiest months (especially April). Air temperatures are fairly constant all throughout the year at an average of 77ºF, and humidity hovers around 80%. Water temperatures are great for all kinds of water sports all over the year with a temperature of 82ºF, and almost no variation during the year. Daily flights depart from the Brazilian mainland towns of Recife and Natal; flight time is about 1 hour, 15 minutes. Remember, the island is remote, and air-conditioned taxis or shuttles are nonexistent. Instead, use the efficient dune-buggy taxi service. Though buggies can be rented, roads are very rugged and those unfamiliar with them risk accidents or rollovers. By law you must carry your passport with you at all times, but you can carry a certified photo copy when you are traveling around town and leave your passport securely locked up at the hotel. Visas are required for some nationalities, including Americans, Canadians, and Australians. Once entering Brazil, all tourists must fill out a an entry/exit card. Immigration will stamp your passport and, if for some reason they are not granting you the usual 90-day stay in Brazil, the number of days you are allowed to stay will be written in your passport. Public minibuses depart at 30-minute intervals from opposite ends of the island, running along the main highway (BR-363) from Baía Sueste to Porto Santo Antonio with stops along the way. The bus runs from 5am to 10pm. Cost is R$3.25. Chances are, wherever you go on the island there’ll be a taxi ponto with a buggy driver waiting for your business. If you cannot find a taxi, NorTax (tel. 081/3619-1314) will dispatch a buggy from its fleet. Prices for all drivers are fixed according to a table, which the driver will be happy to flash in your face should you utter so much as a peep about the cost. The fare from Vila dos Remédios to Baía do Sueste on the far end of the island costs about R$35; from Vila Remédios to the Tamar Visitor Center is R$20; from Vila Remédios to the port, R$15. Tooling around back roads to various beaches is one of the most fun things to do on the island. Buggies can be rented just about anywhere — ask at your pousada. LocBuggy provides 24-hour service, and also rents motorcycles, 4*4s, and powerboats. A driver’s license is not required. The price is currently R$125 per day, though if you rent for several days you can often get a 10% to 20% discount. The cost is the same with or without driver. Gas costs about US$10 per gallon. A day of exploring around the island will eat up about half a tank. Some knowledge of the Portuguese language is helpful; English is rarely, if ever, spoken, written or understood. It’s imperative that travelers to the island bring reais, the Brazilian currency. There is only one bank branch (Banco Real) on the island and no currency exchange offices. Few establishments accept credit cards. Tap water is unsafe to drink, but bottled water is easily accessible. Check with the Projeto Tamar office as soon as you arrive. If a turtle hatching is in the offing, rearrange your plans to see it — you won’t be disappointed. At the visitor’s center, you will see baby turtles propelling themselves through the water in manmade pools as they practice with their flippers. A guide from the center will teach you about the behavior of the sea turtle, which you’ll observe in the shell-toting occupants that swim in the protected waters nearby. The habitat also doubles as an aquarium, sheltering shark species and other aquatic life that share the turtles natural habitat. The beach lies on a secluded bay on the main island of UNESCO protected archipelago Fernando de Noronha, off the coast of Recife. It is best visited via boat, which will stop right in front of the bay to not destroy the corals underneath, or via a narrow staircase, which leads down the cliffs that tower around the bay. 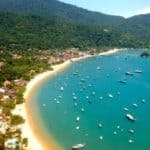 Sancho is also described as one of the best diving spots in Brazil and visitors can enjoy a great marine fauna and flora. During the turtle spawning season from January to July, visitors are banned from the beach between 6PM and 6AM. A 2015 Travelers’ Choice winner, Cacimba do Padre is famous for seashells and soft sand. Jutting out from the sea is the Two Brothers (Morro Dois Irmaos) rock formation. View the remarkable rock formations and watch fascinating nesting turtles in this surfer’s playground with some of the country’s best waves. Rent snorkeling and scuba diving gear to encounter the array of colorful fish that circle around the hills. Take a board and go surfing on the consistent waves, which often reach heights of 15 feet. Free diving is also popular here, although the currents can be dangerously strong at times. Conceicao Beach is a long stretch of fluffy, white sand with spectacular views, palm trees and beach bars. With a consistent flow of waves, it is one of the island’s main surfing spots. Snap photos of the glorious Pico Mount that rises above the shrubbery on the beach’s western end. Play beach volleyball or soccer with locals. Watch the surfers and stand-up paddlers on the water. Deck chairs and umbrellas are also available to reserve on the beach. The best surfing period is December through February, while calmer waters the rest of the year provide ideal snorkeling conditions. Baia dos Golfinhos, or simply Dolphins Beach, is a truly stunning beach and is a “must see” beach. The setting is truly breathtaking with the cliffs, tropical vegetation and the stunning semi-deserted beach all-blending together in perfect harmony. This beach is well suited for swimming as the waves are small. The beach does not offer any infrastructure such as bars, sun beds or other facilities, so be sure to bring some water, snacks and a beach towel with you. One of Brazil’s pioneering Tek diving operations, Atlantis Divers is known due to its structures, for its constant concern with safety and compliance with all international standards, investment in training of staff and maintenance of the best operational equipment and catamarans available in the country. Visit them, their crew will ensure you have the best time and memories in the ecological sanctuary of Fernando de Noronha! For more information call 55 (81) 3619-1371, or visit them on the web at Atlantis Divers. Noronha tours is the best option to book your tours at Fernando de Noronha. Trails, Island Tours, Boat Tours and Scuba Diving. Check out the best of the Island. 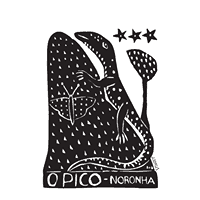 For more information call 55 (81) 3619-1134, or visit them on the web at Noronha Tour. Live the experience of paddling alongside dolphins, snorkel and venture aboard the Hawaiian Canoe in Fernando de Noronha. Tours customized and tailored to participants. For more information call 55 (81) 98351-5083 , or visit them on the web at Noronha Canoe Clube. 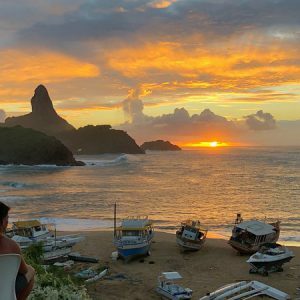 With dramatic rocky backdrops and sparkling turquoise sea, it’s hard to imagine a better place to watch a sunset than Fernando de Noronha. The island is part of the Fernando de Noronha Marine National Park that is protected by strict conservation laws. As a result, there is very little pollution there meaning the clean sky is a perfect canvas for the sunsets’ shades of oranges and pinks and idyllic for star-gazing too. This sunset tour will take you past some of the most famous beaches to find the perfect spot to see the sunset followed by a freshly cooked fish dinner. Explore every corner of the island in one day with an eight-hour 4×4 island tour that takes you to all the island’s most famous landmarks. During this tour, you can visit the best beaches on the island such as Sancho Bay, Cacimba do Padres, and Bay of Pigs, including opportunities to snorkel among turtles, dozens of species of fish, and sharks. 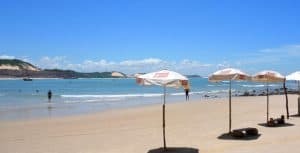 The tour also includes a stop at the Projeto Tamar, a turtle sanctuary where you can talk with a biologist about the conservation efforts on the island, and a visit to the small yet informative Shark Museum. Husband and wife team Ana and Rock serve only eight to 10 people per night at this rustic island gem. The four-course fish-heavy meals are served in a wonderful island setting. There is no advance menu. ana goes with what the local catch dictates, and you find out what that is once you sit down at the long communal table. Delicious! For more information call 55 (81) 3619-0178, or visit them on the web at Mesa de Ana. A feast under an atmospheric palapa hut with tatami mats and pillows, in the yard of a local home. All-you-can-eat grilled catch of the day (barracuda, tuna or mackerel) is served on banana leaves, with great side dishes such as arugula and mango salad, and banana farofa (sautéed manioc flour). There’s a maximum of 20 people seated per night; reservations are required with a 50% deposit. For more information call 55 (81) 3619-1473 , or visit them on the web at Palhoça da Colina. Mergulhão makes full use of its breezy site offering stupendous views over the port, while its Mediterranean menu with a Brazilian twist is one of Noronha’s most innovative. Try the signature peixe crocante (crispy fish stuffed with shrimp, cheese and palm hearts) or the arroz do amado (grilled octopus rice with coalho cheese, cashews and fresh tomatoes). For more information call 55 (81) 3619-0215, or visit them on the web at Mergulhão. O Pico serves excellent seafood rices, moquecas, pastas and specialty coffees from São Paulo, Minas Gerais and Espírito Santo, but it’s the fresh and fabulous array of ceviches (from R$45 to R$52) that, though not traditional, will soon have you forgetting about the Peruvian version; try the classic with biquinho peppers. On Sunday evenings, the script is flipped and it becomes the island’s most sought-after live-music venue. It’s also an art and crafts shop that sells original Northeastern wares, most notably, gorgeous single-leaf woodcuts from famed Northeastern artist J Borges. For more information call 55 (81) 3619-1377, or visit them on the web at O Pico. One of the best value upscale choices, within walking distance of most pousadas and run by a local professional chef. The moqueca and shrimp with okra and tumeric are outstanding. For more information call 55 (81) 3619-1546, or visit them on the web at Veranda. Noronha’s only real beach bar has a fabulous setting beneath a couple of palms, with Morro do Pico towering behind. It serves good beach food, too. For more information call 55 (81) 3619-1679, or visit them on the web at Bar Duda Rei. The famous open-air Dog Bar is the hub – in fact the only locale – of Noronha nightlife. It’s busy every night but really packed from Thursdays through Sundays. There’s music to dance to from around 10:30pm, including live forró on Fridays and a chorinho feijoada on Saturdays, and a saxophonist at sunset during the week. For more information call 55 (81) 3619-1229, or visit them on the web at Bar do Cachorro. 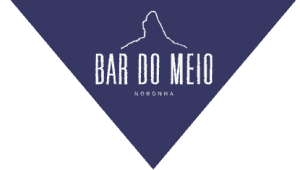 The Buddhist statues and loungers outside create a calming atmosphere at Bar do Meio Noronha which offers a mostly seafood menu, as well as a selection of cold beers, classic caipirinhas, and delicious cocktails. The simple wooden structure and thatched roof of the bar make a serene indoor setting, yet the best spot is the outdoor terrace to enjoy the sea views and picture-perfect sunset. 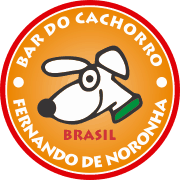 For more information call 55 (81) 3619-0424, or visit them on the web at Bar do Cachorro. For a drink with a view, there are few finer spots than Mergulhão. The outdoor terrace overlooks Fernando de Noronha’s picturesque bay of turquoise water during the day and a sunset in various shades of orange and pink at dusk. The restaurant serves haute cuisine and a selection of appetizers that go perfectly with any of the wines on their extensive menu. The trick to wining and dining at Mergulhão is to arrive late in the afternoon, pick a seat outside, order a bottle of wine, and settle down to watch the sunset. For more information call 55 (81) 3619-0215, or visit them on the web at Mergulhão. O Pico is more than just a restaurant and a bar; it also provides other entertainment, such as live music, open-air cinema nights, and even its own fashion brand in collaboration with Ipanema to produce beach-chic flip-flops. The trendy venue is the perfect spot to enjoy a few cold beers or a traditional Brazilian caipirinha in a laid-back yet lively atmosphere with friendly staff and a good crowd. For more information call 55 (81) 3619-1377, or visit them on the web at O Pico. This property is a 8-minute walk from the beach. Just 1,000 feet from Cachorro Beach, this colorful hotel is located in Vila dos Remédios centre, near the bank and bus stops. It features air-conditioned rooms, free Wi-Fi and tour desk. Surrounded by tropical gardens, rooms at Pousada del Mares display brick walls and local ornaments. They provide minibar, TV and DVD player. Guests enjoy a daily buffe, and dining options are within walking distance. Pousada del Mares´s tour desk organizes excursions around Fernando de Noronha Island, plus activities such as trekking and snorkeling. The hotel also offers car rental and a shuttle service to and from Fernando de Noronha Airport, 1.9 miles away. Free parking on site is available. For more information, pricing, or to reserve your room, visit Pousada Del Mares. This property is a 5-minute walk from the beach. Pousada Triboju offers private bungalows with balconies, an outdoor swimming pool, a hot tub and free Wi-Fi. It is located just a 20 minutes´ walk from Cachorro and Conceição Beaches on the island of Fernando De Noronha. The bungalows at Pousada Triboju are spacious and well-equipped. All feature air conditioning and cable TV. The rooms have a kitchen and a separate seating area and the bungalows are equipped with a private hot tub. Guests can enjoy a buffet breakfast in the morning. For dinner Triboju´s restaurant serves international and local cuisine. Drinks and snacks can be ordered at the bar during the day and room service is available. For more information, pricing, or to reserve your room, visit Pousada Triboju. This property is a 6-minute walk from the beach. Just 10 minutes’ walk from Praia do Cachorro and Praia da Conceição Beaches, Pousada Lua Bela offers a pool and a daily buffet breakfast. Vila dos Remedios historic centre is 0.6 miles away. All rooms at Lua Bela Pousada are equipped with air conditioning and contain a TV, a minibar and a private bathroom. They are simply decorated and provide bed linen and bath towels. Guests can enjoy a buffet breakfast each morning in the breakfast room. It includes a variety of fresh fruits, breads and cold meats, as well as a selection of hot and cold drinks. For more information, pricing, or to reserve your room, visit Pousada Lua Bela. Located amid the nature, with a large garden and only 650 feet from the Atlantic Ocean, Pousada Santuario is a guest house located in Fernando de Noronha. Boasting stunning sea views, each room at Santuario Pousada will provide you with a flat-screen TV, air conditioning and a minibar. There is also a coffee machine and a toaster, as well as a safety deposit box. Private bathrooms come with a shower. Bed linen and towels are provided. Guests benefit from a daily breakfast. Santuario Guest House offers free parking. Balconies and hammocks can be found in the property. For more information, pricing, or to reserve your room, visit Pousada Santuario. This property is a 18-minute walk from the beach. Located in Fernando de Noronha, 2,050 feet from Vila dos Remedios, Pousada Maria Bonita Noronha features a year-round outdoor pool and sun terrace. Every room at this guest house is air-conditioned and is fitted with a flat-screen TV. You will find a coffee machine in the room. Each room has a private bathroom. For your comfort, you will find free toiletries and a hair dryer. For more information, pricing, or to reserve your room, visit Pousada Maria Bonita Noronha. Wow! It really makes you want to go haha! Very good article! It’s really complete and interesting! Thank you for all your advice. It is a beautiful beach destination Sabrina. Thank you for visiting Fernando de Noronha Brazil Vacations. It’s beautiful! I never heard of this island before but after reading this it will go definitely on my bucket list. What worked for the island is to have the protection from the government to preserve it. Having a minimal amount of travelers may seem as controlling but if there is no overview a big amount of tourist on the island may damage it with waste which could affect not only the land but also the sea creatures (like the rules). I am curious to know how many flights are available per day? Let’s say something happens and I missed my flight, how long do I have to wait to board the next one? Boy, that is one question I cannot answer. I am not sure how many flights there are a day. If you miss your flight, that could be a problem. But, in honesty, I am not sure. It is definitely a bucket list beach destination. Thanks for reading! Wow, this island looks BEAUTIFUL!! And I think the taxi buggies are adorable. Thanks for letting me know about the currency. We are so used to using Visa everywhere, and ATM’s. 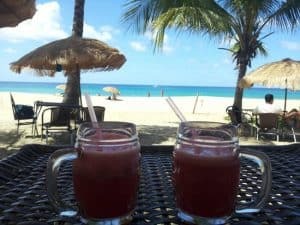 Can you tell me if there are any “all inclusive” resorts on the island? Unfortunately, I do not know of any all inclusive resorts here. There are some really great 5 star hotels there though. And yes, this is one of the most beautiful areas any where hands down. Thanks for reading about Fernando de Noronha Brazil. Fernando de Noronha sounds absolutely relaxing. I think, when I am there, I will have to see the turtle hatching. It must be a marvelous feeling to see life spring forth from an egg and watch them run towards the sea. Since our planet needs our help, turtles need to be protected. I do have a question though. What is the best time of year to see the turtle hatching? I imagine they do not hatch regularly throughout the year, so, if I could time my vacation there in line with the turtles, that would be very nice. I look forward to reading your answer. Thank you so much for your thoughtful article and I hope you have a wonderful day! Great question Alex! The turtles actually hatch from December – June. So you have a wide time span to plan your vacation for 🙂 And yes, this is a very relaxing beach destination. You would fall in love with the place! Fernando de Noronha​ seems a really cool place to visit. Somewhere a bit off the beaten track. Thanks for the warning about taking the local currency. I usually don’t bother and rely on cards or ATMs. I think a lot of people now have this casual attitude to currency exchange. What do other readers of this blog think about the best ways of getting local currency. Maybe I think differently being a Brit. No, I know I agree with you. I rely on my debit/credit cards as well. I do generally take some cash in the foreign currency of the country, just for things I might want to buy/barter for. Also, boat rides and taxis generally do not take cards. Thanks for reading Ray. What a beautiful and unspoiled place Fernando De Noronha is! Truly beautiful, and totally natural looking beaches – you would just feel like you were in paradise lying on one of those. And can you imagine seeing a dolphin leap spinning into the air? I would love that. I also love the fact that it is so authentic too, you would really feel like you are getting away form it all, especially as the place is not crammed full of tourists. I never heard of somewhere that only lets so many tourists in, but it is a great for authenticity and I guess the locals prefer that too. So, is there a waiting list for a holiday on this Island? Hi Stefanie, and thanks for reading….and learning about Fernando de Noronha, Brazil. You asked a great question about the limited number of visitors. There is not a waiting list per se, you just have to make your travel arrangements well in advance. I would say a good 6 months in advance. It is all about planning to get to this great beach destination. It sounds wonderful in Fernando de Noronha and it’s great to hear that they limit the number of visitors to protect the environment. Thailand needs to start doing that! If visitor numbers are restricted, does that mean you have to book a long way in advance? If you’re lucky enough to get to visit this island, it sounds sure to be a fantastic and memorable vacation. Great question! Yes, you definitely need to book in advance. Airfare first, and the once that is secured, hotel. Glad you enjoyed reading! Thanks for visiting Fernando de Noronha Brazil Vacations! Fernando de Noronha looks amazing! I have always wanted to travel to Brazil. Is it safe to visit Fernando de Noronha though? I know a lot of places in Brazil have a lot of crime. I remember years ago my aunt got her purse stole at Walmart in Mexico, though. Kind of an odd question but how come they only allow 420 tourists to be on the island at a time though? Great questions Garen on Fernando de Noronha. Yes, this island is VERY safe. You will not have to worry here about crime. They restrict the number of visitors to control damage to the environment. The beaches are as beautiful as they were 500 years ago. Everything is well kept. Thanks for visiting! Thank you AJ for visiting and learning about beach travel to the wonderful island of Fernando de Noronha. I agree with you on taxis. I actually think that in the long run, then can be cheaper, especially in a foreign country. I just wonder how must does the flight to Fernando de Noronha cost (from both Recife and Natal)? Or is this in the lottery format, where the luckiest 420 candidates get the tickets? Thanks for stopping by Fernando de Noronha Brazil Vacations. As far as visiting this wonderful beach destination, you just need to book your flight well in advance. They will not let you purchase the ticket if the island visitor limit is reached. I can’t really tell you how much an airline ticket would be, as there are so many variables for that. Looks like a beautiful place! Watching the dolphins from the beach must be a great sight to see! You mentioned in your article that currency exchange is difficult, if not impossible. Has this been an issue for tourists who have made this trip, and if so, how is this situation been managed? Thanks for sharing this very in-depth, informative article! The best thing to do Luke, is to exchange your money before heading to Fernando de Noronha Brazil. Then there are no worries. I agree that Conceicao Beach is the one I would go to as well 🙂 Thanks for visiting! This Island vacation sounds great, a little too demanding on the person going there. This is a once in a lifetime or a bucket list item for those who plan way ahead. I know a little Spanish, will that help any. How much trouble is it to get a visa to Brazil. Ok, it is not too hard to get your visa, but it can take up to 90 days. But, since you need to plan well in advance for this dreamy beach vacation, the visa can be done at the same time 🙂 Yes, definitely a bucket list item and a nice wallet for it 🙂 It will be a little more on the expensive side compared to most other beach destinations. The little bit of Spanish will help some. Thanks for reading! Fernando de Noronha, Brazil is a great vacation destination! To be one of the 420 tourists on the island is a blessing. Thank God they don’t allow cruise ships to come in and take over. I like the fact that it is secluded and not overcrowded with tourists. Makes for a better vacation. Good hotels and restaurants on the island. Plenty to do. 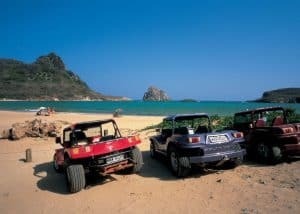 Best to take the 4×4 Off-Road Tour of the Island to see and experience everything. Yep, agreed! I would definitely do the 4X4 Off-road tour. I would also want to make sure I visited Baio do Sancho Beach. Yes, you are right…so glad cruise ships are not allowed! Thanks for visiting Beach travel destinations. 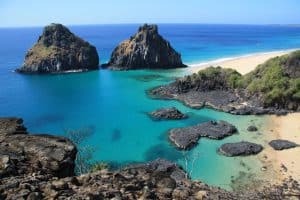 Fernando de Noronha Brazil vacation sounds great, just from the leaping dolphins, the chance to see baby turtles hatching and then there are the breathtaking beaches. It definitely sounds like you will want to have a plan in place before you go that way you get to the island. Do you have any idea of the number of people who wait to go? You mentioned they only allowed I think 410 at a time but how long do most stay on the island when they get there? It is not so much a “waiting list” per se, as it is to secure your visit. What I mean is, if there are seats on the flight there and a hotel room, then you are good to go. They will only allow flight options, if there is availability on the island. Once you have your flight (make well in advance), then you can go ahead and book your hotel. It is kind of different, in that only so many people are allowed, but so well worth it! Thanks for reading and learning about Fernando de Noronha Brazil. Great Steven! Please let me know if I can help with your planning. I hope you did see the best hotel picks towards the bottom of the post? Thanks for visiting Fernando de Noronha Brazil Vacations! How does one get there exactly? I know you mentioned that its remote and dune buggies are the best but is there some local service one can book before hand? Or is it best to go there and book you think? Ok, in my post I went over getting to Fernando de Noronha Brazil. If you can shoot me a message as to where you are located, I can give you a more detailed description. To rent a dune buggy, you simply go thru your hotel (pousada) to make the reservation. They will do that for you. Please let me know if you have any other questions. Thanks for stopping by!